Review notes that Paralegal roles continue to expand. In fact, the job outlook (unlike for many other professions) is quite bright. Paralegals are a key component of an efficient law practice, and their role continues to expand. In fact, the job outlook (unlike for many other professions) is quite bright. Paralegals must undergo specific education, training and/or work experience and are utilized by many different employers, including individual practitioners, law firms, corporations and various government agencies. Different certifications and credentials are available to classify the Paralegal experience. In the traditional law firm setting, the Paralegal's time is primarily spent on substantive legal work which is billed to clients at market rates, similar to other professional staff, but at a significantly lower rate than would be charged had an Attorney been solely utilized to handle such work, as was standard in the past. This hourly billing option distinguishes Paralegals from other non-lawyer staff members. However, many legal or quasi-legal organizations do not specifically bill for Paralegal time, such as Real Estate Title Firms, Immigration Law Firms, or Bankruptcy practices. Thus, in many organizations, time spent on administrative or clerical functions is not billable to the client’s case. Only licensed attorneys may give “legal advice” to clients, and ethical rules in all U.S. States are uniform that Paralegals are strictly prohibited from doing so. Paralegals also are prohibited from directly accepting a client’s case, setting any fees, or representing a client in court (unless specifically authorized by the court, see below). All U.S. States require attorneys to be licensed and most have regulations imposing strict penalties for anyone who engages in the unauthorized practice of law. In fact, there are rules requiring appropriate supervision of Paralegals. This information is confirmed by the Occupational Information Network (O*NET), an online database that contains hundreds of occupational definitions to help job seekers, businesses and workforce development professionals to understand educational and occupational trends in today’s economy in the United States. O*NET was developed under the sponsorship of the US Department of Labor/Employment and Training Administration (USDOL/ETA) in the 1990s. According to O*NET, the future outlook for Paralegals is bright. 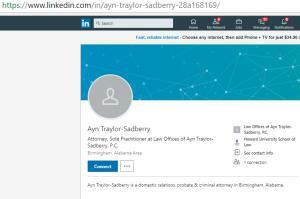 Ayn Traylor Sadberry is a domestic relations & family law attorney in Birmingham, Alabama. Ms. Traylor-Sadberry received her B.A. 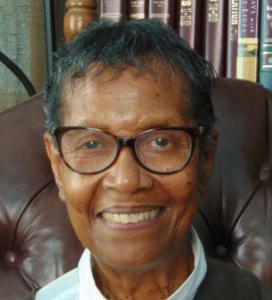 degree in 1966 from the University of Oklahoma, her M.A. in 1973 from the Oklahoma City University, and her Juris Doctor from Howard University School of Law in 1981. She was admitted as an attorney in Alabama in 1989.